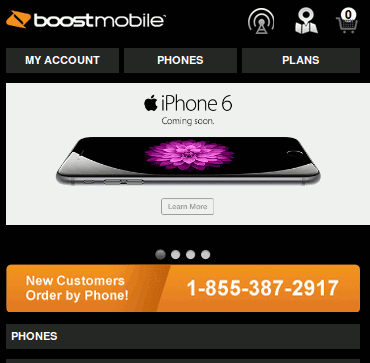 Home - Apple , Boost Mobile , News , Prepaid iPhone - Boost Mobile Announces it's Getting the iPhone 6 "Soon"
Boost Mobile Announces it's Getting the iPhone 6 "Soon"
A banner trumpeting "iPhone 6 Coming Soon" has appeared on the Boost Mobile Website . Unfortunately there's no word on when Boost will be getting Apple's latest or what the price will be. The Learn More button on the site just takes you to a bunch of Apple supplied promotional material. Historically Boost Mobile has priced its new iPhones at $100 less than full retail. If that pattern follows, Boost's iPhone 6 16GB model will come in at $549, with the 64GB and 128GB models priced at $649 and $749 respectively. As for the date, last year Boost got the new iPhone Nov 8, 49 days after the postpaid and Apple Store launch. But Boost stablemate Virgin Mobile got the iPhone 5s on Oct 1, only 11 days after postpaid. It looks like Sprint is giving Boost all the love this year, as there's no mention of the iPhone 6 on the Virgin Mobile site yet. The iPhone 6 went on sale on postpaid on Sept 19 this year, so I'm guessing that we could see the iPhone 6 on Boost as soon as Sept 30, 11 days after the 19th. Oh boy, I think I'll hurry up and get one of these .... NOT! I don't want to spend a lot of money for a pretty night light which is all the iPhone 6 will be on a network as crappy as the Sprint native network. Sprint has been making a lot changes to boost with price plan changes, promotions, commercials, etc. They don't really promote virgin like they do boost very interesting. Sprint is taking Virgin Mobile out of the dealers and just focusing on Boost. Really? Are you a Virgin/Boost Mobile dealer who is no longer able to sell Virgin? I'm a dealer and on the last meeting Sprint said that Virgin Mobile brand will phase out of the dealers doors, will only be available at those big retailers. We can still sell Virgin until our master agent sells out of the current inventory. We should start receiving a conversion kit for Virgin displays to be converted to Boost. They are focusing only with Boost very aggressively. That doesn't sound good for dealers. Sometime in the future when Virgin is in big box stores only, Sprint could start promoting it heavily and taking customers away from Boost dealers. Similar to the way TracFone/NET10 competes against dealers with Walmart-only Straight Talk. Does it make sense at all for there to be a Boost AND Virgin at Sprint? Any mention of wifi calling on these for boost? Is there any other operator that sells the new iPhone with a discount of $100 or more? Sprint has the worst data speeds, wonder why some still stick with them. Unless you got Sprint Spark, you've got no reason to stay. You got that right. Not too long ago, I switched back to T-Mobile. At least data coverage in my area is excellent with Tmo. Price might be a little steep. But it is worth it. I'm thinking of transferring my boost number to google voice and opening up a harbor mobile account as I use my cell primarily for business. I do not trust the longevity of Harbor Mobile with my cell number but I also do not see a good future for Boost Mobile. T-Mobile has the worst coverage where I live. Their building penetration is really bad. Boost is pretty good here. A boost store rep posted on howardforums saying starting October 1st boost will offer a family plan with 4 lines for $100. Boost is stepping there game up. I know. I have about 28 customers waiting for this phone. We just received the HTC Desire 510 which is nice looking too but the Aquos beats it by far.